Mobile Mirror is an exclusive digital POS solution distributed via Crystal Clear designed specifically for the fashion industry. German designed and built it is at the forefront of the European fashion industry. Spot me is an effective social marketing retail digital solution offering your customers a fun and exciting way to share photos while giving you the opportunity to promote your business and products to new potential customers. 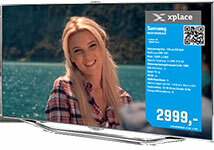 TV-L – The digital price tag directly on the TV screen. All product information is displayed automatically as a layer, regardless of the image on the screen. The price update coming in real time from the DWH. With digital signage, retail businesses can use multimedia – videos, images, music – to present timely information that can trigger positive reactions or responses from those who will see them. Multimedia works so much better in engaging audiences, and apart from appealing to the desires of the audience, multimedia is also more effective in establishing the relevance of products or services. Instead of the usual commercial films, a video can be used to show how the product addresses the needs that most people have. Crystal Clear Business Services provides tailored retail digital signage solutions. Digital signage in a retail environment is a powerful tool that can deliver up to date relevant content to inform and influence your customers behaviour at point of sale. Digital displays can be used throughout the store for branding, merchandising, promoting specials, and educating or entertaining customers. Digital signage can take care of frequently asked questions that often tie store personnel up for quite a while with curious customers. By playing an instructional video or a slideshow that answers FAQs instead, salespeople can focus on other areas of operations that truly require their presence and attention. Digital signage can improve customer shopping experience by displaying entertaining content to create or support a friendly ambience within stores. Even those who are just accompanying a friend inside the store and are not really there to buy can get a positive impression of the business and may, in the future, come back and be a real customer.